Trained as a classical musician, with his background of Arabic music, Shalan masters both genres playing and composing. Elements of variety of musical styles are unmistakably recognized in his compositions . Shalan also wrote and arranged music for a plenty of orchestras, ensembles, singers, films and TV shows. Plays with GFVP (Gent Folk Violin Project), Olla vogala, EPO (Expat Philharmonic Orchestra) and Damast Duo. 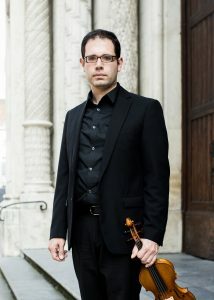 Musical director of of the Syrian-Turkish-Belgian world music orchestra Jiraan. 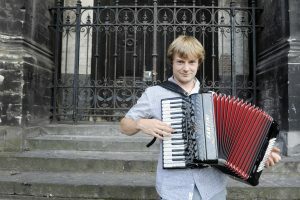 Jonas Malfliet is a Belgian musician and composer who plays a wide range of musical styles on piano and accordion. Since leaving his law practice behind, he has toured Europe, China, Congo, and South-Africa with world music bands such as Les Busiciens, Olla Vogala, and Transpiradansa. Together with violinist Shalan Alhamwy he formed Damast Duo, he is part of the Syrian-Turkish-Belgian world music orchestra Jiraan, and is resident pianist on Radio 2’s satiric programme “De Rechtvaardige Rechters”. Teaching traditional music by ear and conducting ensembles became second nature to him after attending a lot of international Ethno music camps, and leading the East-West and Balfolk ensembles of Muziekpublique. He is also involved in theatre productions as a multi-instrumentalist and actor.